One of the first real times I ever remember getting in trouble when I was younger was taking apart the phone jacks in my house then frantically trying to figure out how to put it all back together again before my parents got home. This was before the era of Google and YouTube so restoration was based on hand written notes, Usenet groups or IRC friends. For whatever reasons phones have always been that IT\IS element that has always excited me. After trying to explain to my parents at a young age that what I was doing wasn’t wrong but rather exploring it lead to a period of: boxing, crystal swaps, tone dialers, hook flash dialing, DISA and one particularly fun story explaining to a local authority why I was holding a modified Hallmark Recordable Card up to a pay phone. As I hit my early 20’s I realized that I could actually make a living out of my love of phones and figured that those exploratory items above were no longer worth the risk of losing the foundation of a career. Someone say something about growing old taking the life out of us. I have no idea what passes for phreaking currently. I imagine it involves a mix of Wireshark + spoofing + other + the final ingredient that was always the easiest to exploit: social engineering. At the periphery I still maintain my subscription to 2600 but where I previously might have read something in there and then actually tried it my reading now is just purely for hypothetical enjoyment though what is still exciting to me no matter how old I get: completing a project and hearing dialtone regardless of it is 48 volts or simulated will always make me smile. Blue Tone generator, emitted 2600 Hz tone to disconnect a long-distance call while retaining control of a trunk, then generated multi-frequency tones to make another toll call which was not detected properly by billing equipment. Obsolete as it relied on use of in-band signalling of the no longer used Signaling System 5. Black A resistor bypassed with a capacitor and placed in series with the line to limit DC current on received calls. On some mechanical relay switching systems, separate relays were used to stop ringing on an inbound call and to start billing timers. The black box was intended to trip one but not both relays, allowing ringing to stop but not showing the call as answered for billing purposes. Obsolete with the replacement of mechanical relay exchanges by electronic switching systems. Red Tone generator, emitted an Automated Coin Toll Service tone pair (1700 Hz and 2200 Hz) to signal coins dropping into a payphone. Obsolete. Green Tone generator, emits ‘coin accept’, ‘coin return’ and ‘ringback’ tones at the remote end of an Automated Coin Toll Service payphone call. Obsolete as these tones controlled phones designed to rely on manual operator assistance for coin-paid long distance calls. Clear Microphone and amplifier, coupled inductively to payphones where the handset microphone (and just the microphone) was disabled until a coin was inserted. An “opaque box” was a variant which also included a keypad. Obsolete as specific to a rarely used post-paid coin phone design which is no longer deployed. Violet A resistor (several hundred ohms) which could be clipped directly across the line to make it appear off-hook or in use. Gold Diverter. Calls received on one line are forwarded elsewhere using a second telephone line. Beige Telephone installer’s test handset; a standard telephone set on which the plug has been replaced with a pair of alligator clips. 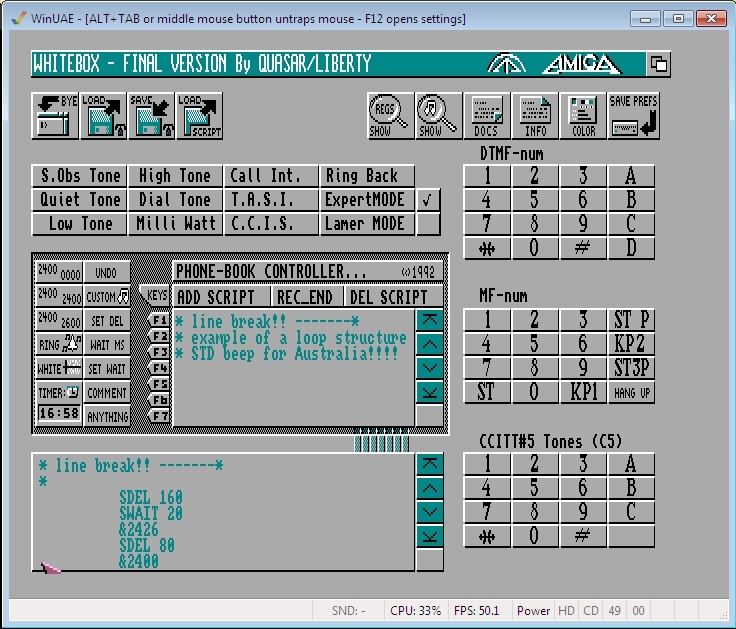 White In Australia there was a software program based on the commodore Amiga 500 personal computer called White box which was used for phreaking, it used CCITT#5- (R2) tones to manipulate the phone systems in Australia in a similar way to blue boxing white box screenshot. In other countries white box can be referred to a Portable DTMFtone-dial keypad with speaker which was used to access an answering machine to hear your messages when you were away from home and also could be used on PBX phone systems that required tone dialing & used to generate tones if the telephone is rotary-dial or its keypad is locked. Silver Tone-dial keypad with four extra buttons (A, B, C, D) formerly used to indicate priority on military autovon calls. Magenta AC ringing current generator, connected directly to a telephone to make that phone ring. Orange Caller ID frequency-shift keying generator, connected directly to a telephone to send CID. Vermilion The combination of a magenta box and an orange box.